If you look at a map of Italy you see Venice at the very eastern edge. Any Venetian knows that it was once at the center. In the sixteenth century when the rest of Italy was a patchwork of warring states, Venice was the second largest city in Europe and by far the richest. The government known as the Serene Republic ruled their domain shrewdly, planted colonies all over the Eastern Mediterranean, and controlled the spice trade for most of Europe. If you give cooks a few hundred years of access to the world’s spices and a public that can afford them, they get pretty good at subtle seasoning, and it is that characteristic that Venetian cooking is most noted for. Cuisines further down the peninsula use garlic and pepper more enthusiastically. The Venetians prize finesse. Italian migration to the U.S. was mostly from the Southern regions, and Venetian cuisine is relatively little known here. 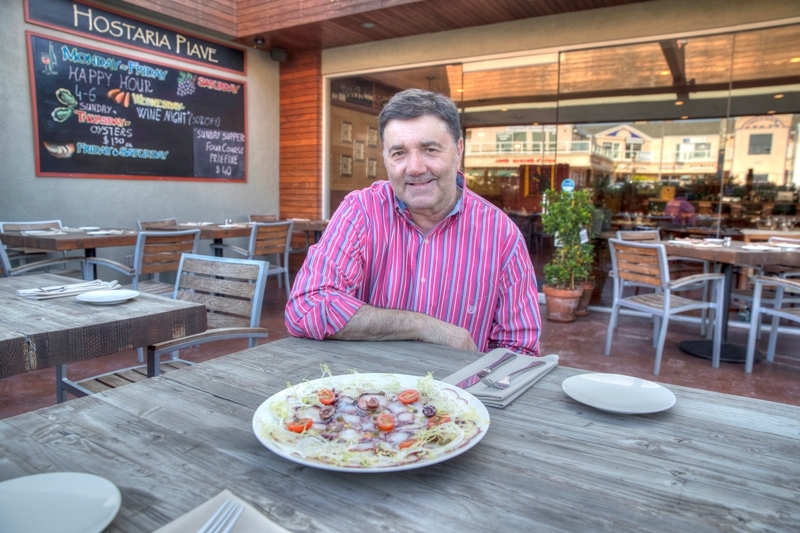 The lone outpost in the South Bay is Hostaria Piave, a stylish restaurant near the corner of PCH and Torrance Boulevard. The restaurant was opened by Angelo Calderan, a Venice native who worked at prestigious restaurants in London and Beverly Hills before opening in Redondo in 2011. When I reviewed the restaurant in 2012 I remarked on the understated décor, mix of rustic and refined dishes, and the way the menu sometimes uses fairly obscure terms in the descriptions. None of these have changed substantially, but improvements in web access on mobile phones have made it easier to look up obscure terms. Even so we appreciated the fact that the servers here know this cuisine and explain it well. We started one meal with starters of smoked beef carpaccio with mushrooms and smoked albacore with salsa verde, a mix of herbs, anchovy, onion, and olive oil. Pairing the two smoked items turned out to be a great idea. They were remarkably different despite the similarity in concept. The thin slices of raw albacore had a wisp of sharp, smoke flavor that was enhanced by the fruity olive oil and a dusting of sea salt, with the salsa occupying the same niche as the ginger and scallion topping that is used in sushi. By contrast, smoking the beef slightly and topping it with sautéed shimeji mushrooms and Parmesan cheese enhanced the richness of the meat, which used earthy, funky flavors as counterpoint. (And in case you wonder why shimeji mushrooms are in an Italian restaurant, they’re similar to an Italian mushroom that doesn’t travel well.) The two dishes showed how smoke can enhance the main ingredient in different ways, and I suggest that you repeat the experiment. We followed those starters with a pair of pastas, a plate of linguini with pesto, green beans, and potatoes and an order of pasticcio, which is the Adriatic equivalent of lasagna. Pasticcio is usually seen in Greek restaurants, but since the Venetians ruled much of Greece at various times it’s no surprise that there are culinary crossovers. The layers of noodles are interspersed with béchamel sauce and a mixture of ground beef, pork, and ham. It’s an interesting variant on the familiar theme. The pasta with pesto, potato, and green beans was the only item from this meal that we wouldn’t order again, and it wasn’t bad, just less revelatory than the others. It’s a fine, simple item, one of several that vegetarians can enjoy here, but less interesting than the others we tried. Since we had ordered two starters and pastas we shared one main item, roasted rabbit legs with house-smoked pancetta in a sauce made with a touch of veal stock. Rabbit is a low-fat meat that is easy to dry out, and the moist, rich meat on these plump legs was proof of art in the kitchen. The plate came with a neat stack of fried zucchini on the side, and we barely had room for a shared dessert afterward. That was a lemon-basil tart with a few drops of balsamic vinegar on the side. It was a thought-provoking item. Basil and lemon are showing up in cocktails and other non-traditional places lately, but I don’t often see it in a desert setting. I’ll be playing with it in different recipes now, because it certainly worked well here. If you’re buying wine by the bottle here you have some remarkable choices, including Brunellos from the early ‘90s, a splendid list of California Cabernets, and a Champagne list that made me wish for an expense account and a chauffeur. The wine by-the-glass list is less spectacular but has some relatively obscure items alongside old favorites. I particularly liked a minerally, fruity Lugana that ran eleven bucks for a generous pour. Trust your server and ask for tastes and you can discover something new here. As pleasant as my midweek dinner at Hostaria Piave was, the best day to show up here is Sunday, when they offer a five course meal for only $40 plus tax and tip. At a recent Sunday supper this included antipasti, braised baby octopus in paprika sauce, red beet raviolis in poppy seed butter, grilled sausage and pork ribs with rosemary and garlic, and gelato for dessert. This is the great dining deal of the South Bay and if you are omnivorous you should stop in and be surprised. All others can check that week’s menu, which is posted on their website a few days in advance. I enjoyed everything at that meal, and will be watchful for those beet ravioli on the specials list because they were sensational. Dinner at Hostaria Piave is moderately priced for the area – pastas run from $13 to $21, grills and mains from $25 to $33, and a dinner for two with a glass or two of wine will typically run about $130. For the experience of an unjustly obscure region of Italy, cooked by a master, it’s well worth it. Hostaria Piave is at 231 South PCH in Redondo. Open Mon. — Thurs. 4 p.m. – 9 p.m., Fri. — Sat. 4 p.m.–10 p.m., Sun 5 p.m. – 9 p.m.. Parking lot, patio dining. Wheelchair access good, wine and beer served, corkage $20. Menu at hostariapiave.com. (310) 374-1000.